OK, dear readers, it is time to stretch, go to the bathroom, and buy a bag of popcorn. I will be taking a brief hiatus from these writings to travel to Malaysia and Japan and, yes, the trip will be on the other guy’s dime! (Is there any other kind?) I return in mid-November to resume my story and pass on yet more information and advice. But until then I have wonderful news about the publication of my new book On The Other Guy’s Dime: A Professional’s Guide To Traveling Without Paying. Publication is set for November 15th, and it is now possible to preorder the book, either directly from the publisher, Itasca Books or on Amazon.com. (Eventually, it will be on both Barnes & Noble’s and Border’s Web sites, but not quite yet. ﻿So, please use this brief intermission to read (or reread) any of the previous 61 blog posts, and then check back in a few weeks when this narrative will be resumed. Even easier, just hit the Sign Me Up button in the right-hand column and you will be notified by email when the next post has been put up. Enjoy the break, and I will be back blogging shortly. In 1992 Zimbabwe was the success story of southern Africa. It was proof positive of the lies of apartheid and the bigotry of those whites who treated black Africans like children, unable to rule themselves. It was also a wonderful counterexample to the belief of many Americans that Africa is nothing more than urban slums, children with distended bellies, and people dying of starvation. On the contrary, in 1992 Zimbabwe was a country that provided its inhabitants with economic stability, good schooling, basic health care, and access to such essentials as food, housing, roads, and sanitation. According to the World Bank, from 1980, when the country first achieved independence, until the early 1990s infant mortality decreased from 86 to 49 per 1000 live births, child mortality was reduced from 128 to 58 per 1000 live births, the immunization rate increased from 25% to 85%, and life expectancy for its citizens increased to 64 years. When we lived there Zimbabwe had a lower infant mortality rate, higher adult literacy and higher school enrollment rate than almost any other developing nation in the world. Simply put, the country was working, and working well. When walking along the tree-lined avenues of downtown Harare, overflowing with shops and cafes, you could be forgiven for thinking you were in a mid-sized American or European community rather than the heart of southern Africa. Sadly, though, this social and economic success came to an abrupt end by the mid-1990s when Robert Mugabe, president of the country since 1987, began devolving from a benevolent leader into a brutal dictator with a death grip on power and an intolerance for public dissent. Mugabe, who enjoyed the perks of power and had no desire to relinquish them, began a campaign of repression of anyone who opposed him politically or wanted to run for the highest office in the land. He also imposed a series of draconian economic and social reforms that bankrupted the country. He unilaterally imposed a poorly conceived land redistribution program, against the recommendations of the United Nations, that took farmland from whites and gave it to black political supporters even if they had no experience in managing an agricultural enterprise. Soon after, the food surplus in Zimbabwe began to wither and disappear. His hatred of the British led him to destroy the once impressive health care infrastructure established during colonial times. In an article in the New York Times columnist Bob Herbert wrote “If you want to see hell on Earth, go to Zimbabwe where the madman Robert Mugabe has brought the country to such a state of ruin that medical care for its inhabitants has all but ceased to exist.” By the start of the 21st century he was running the country like a fiefdom whose sole purpose was to generate power and wealth for he and his family. The end result of his ruinous policies was that by the year 2000 life expectancy at birth for Zimbabwean men, once 64 years, had dropped to 37 (34 for women)–the lowest such figure for any country on earth. Economically, the nation did not fare any better. 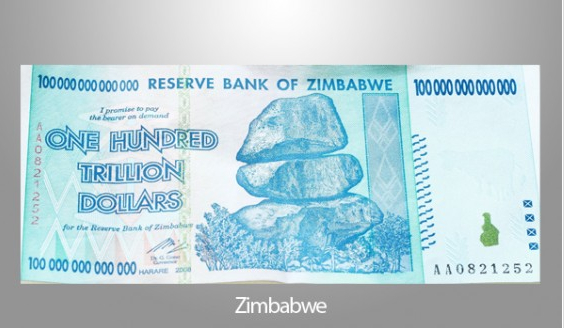 It has one of the worst financial systems of any country in the world, with inflation running at tens of thousands of percent per year, making the currency essentially worthless. The effect of this on citizens was tragic and led to poverty, starvation, disease, and a mass exodus of people fleeing the horrors of their once lovely country. It is difficult for me to write this post because of my memories of a beautiful country whose citizens were able to care for their families and provide them with the essentials of life. It does not always take an army to bring down a nation, and Zimbabwe is a tragic example of how a single misguided (or demented) individual can destroy the dreams and aspirations of millions. Please remember that when you go to the polls to vote for anational leader. Don’t take this responsibility lightly or make your choice based on clever slogans, superficial promises, or a cute hairdo. The stakes are far too high. When we returned home from Zimbabwe after three glorious months, I shared stories of our adventures with Paul Tymann, a close friend and co-author with me of a computer science text entitled Modern Software Development Using Java. Paul is professor and computer science department chair at the Rochester Institute of Technology in Rochester, New York. Like Ruthie and me, he had long dreamed of going on an African safari but believed it was a dream well beyond his reach. Paul had never considered, in fact was not even aware of, the idea of a working vacation until I related our work experiences in Kenya and Zimbabwe and described how I was able to plan and finance these trips. After listening to my stories and determining that this was something he truly wanted to try for himself, he contacted Dr. Rob Borland at the University of Zimbabwe (UZ) and carefully followed the steps I laid out for him during our talks. He was soon rewarded with a teaching invitation, and the following summer Paul was comfortably ensconced at the UZ Visitor’s Lodge reliving many of the same African adventures Ruth and I had experienced only twelve months earlier, including that amazing walking safari at Mana Pools described in my previous post. This is yet additional proof that there is absolutely nothing unique about me or my background when it come to living and working overseas, and it clearly demonstrates that a working vacation to some exotic locale is a dream that can come true for virtually any professional with the drive and ambition to follow the recommendations contained in this blog. This story also highlights an excellent way to locate your own working vacation and exemplifies a strategy that often works far better than random cold calls to unfamiliar places. If you know of a friend or colleague who has recently been on a working vacation talk with them about the living accommodations, workload, colleagues, and the school, agency, or institute where they were posted. If they speak glowingly about their experience then get the name and address of a contact person and send that individual e-mail asking about the possibility of working there in the near future, being sure to include your friend’s name. It would also be a good idea for your colleague to send an enthusiastic letter of recommendation directly to the institution or give you a copy to attach to your e-mail. If the people at the host site were pleased with your friend’s work, they might also be amenable to a visit from someone recommended by that individual, just as I had personally recommended Paul. This approach does not qualify as a “blind cold call,” like those described in earlier chapters, since the institution has already demonstrated an interest in hosting overseas visitors, resulting in a greater likelihood of success. In essence you are no longer scattering your working vacation seeds randomly but planting them in ground already well watered and nurtured by the work of others. Is That A Charging Elephant or Is He Paying Cash? The highlight of our time in Zimbabwe was a trip to Mana Pools, about two hundred miles north of Harare. Totally unknown prior to our arrival, we heard numerous stories from guests at the UZ Visitor’s Lodge about a wildlife viewing experience thoroughly unlike that of more well-known destinations such as the Serengeti or Masai Mara. Mana Pools is the only game park in Zimbabwe offering walking safaris that attempt to recreate the classic big-game hunts of the nineteenth and early twentieth centuries—before the advent of satellite phones, Land Rovers, GPS location systems, and trucks laden with luxury provisions and all the comforts of home. Back then the only game you saw was what your guides could locate on foot, and the only provisions available to you were those carried on the backs of porters. It sounded fascinating so Ruth and I purchased a four-day packaged tour to Mana Pools from a local travel agency. We were met at the park’s front gate by our guide, Willie DeBeers, a grizzled sixty-something Afrikaner toting a massive elephant gun and missing two fingers on his right hand, courtesy of a close encounter with a spotted hyena. Each day our group of a dozen or so would walk for six to eight hours searching for game as Willie kept a watchful eye to the front for unfriendly beasts; the porters had our backs. Since we were on foot and without access to a locked vehicle for safety, we would stop when passing a tall stand of grass to let Willie make sure nothing unfriendly was lurking in the shadows. Our daily route was not preplanned but dictated by any signs of animal life spotted by the guide—footprints, spoor, recent kills—as well as the presence of irritable beasts that required a large cushion of space between themselves and human intruders. One morning we happened across a massive bull elephant only a few hundred feet ahead, bellowing and scraping the ground with his right front leg. Willie informed us this behavior meant he was about to charge, and right on cue he did–all four tons of him, heading straight for the group at a full gallop. I froze in utter terror until he came to a dead stop not thirty feet away. Willie laughed and informed us he could tell from the animal’s demeanor this would be a “false charge,” and that the elephant would stop before reaching us. We were then told to move slowly backward from the angry beast—still standing in front of us—and everything would be just fine. He had let the elephant charge to give us some excitement and provide a great story for friends and family back home. 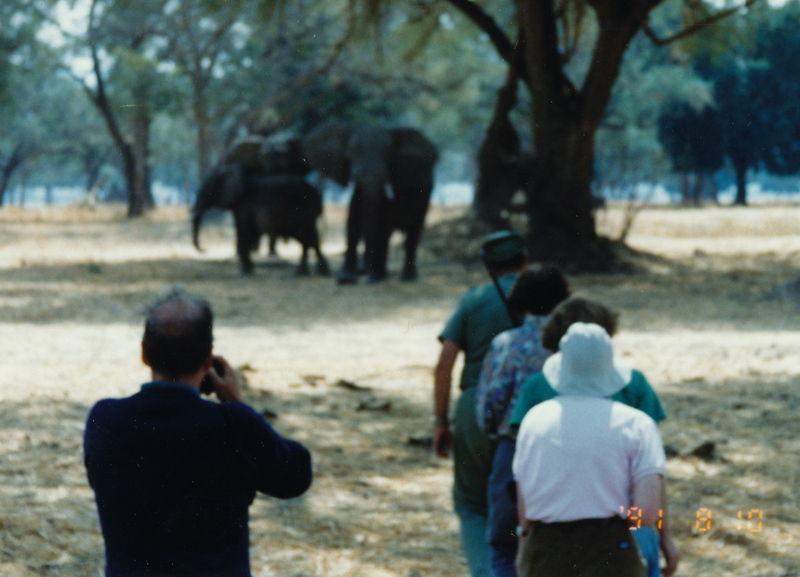 Three weeks later a story appeared on the front page of the Zimbabwe Herald about a University of Zimbabwe geography professor trampled to death by a rogue elephant at Mana Pools. I can only assume this animal was uninformed about Willie’s rule requiring all elephants to clearly indicate a false charge. This was a little too much for me in the way of recreating nineteenth-century realism, but Willie was right about one thing. I did end up telling this story to family and friends as soon as I got back home.